Floris Naturals is a small herbal products company based near Tampa, FL. We manufacture a range of herbal products for applications in the animal care sector. We also make a smaller number of products that are suitable for human skin applications. Pioneer does not manufacture cosmetic products. All our products are hand made here in the USA using herbs and natural oils (plant oils). Our products contain only ingredients that meet national, and in many cases, international regulations. Floris Naturals products are sold in 12 countries. We have been designing our recipes and formulae for 30 years – since 1986. Our products are mainly used in the equine and canine sectors. 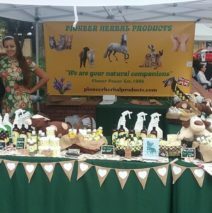 However, we make products that are helping owners with problems with cats, alpacas, llamas, poultry, pigs, rare breed goats and sheep, birds of prey, racing pigeons, budgerigars, and lovebirds. Equine: Sweet Itch, White Line Disease, Mud Fever (Rain Scald, Sheep Scald etc), Wound Care. Herbal Liquid Soap for Horses (antifungal), Thrush on equine frog (antifungal) and insect control. Canine: Herbal Liquid Soap (Shampoo) for Dogs, Wound Care and Animal Care Sprays against itchy skin, fleas, mites, lice, mange, and flying biting insects. The spray is suitable for spraying all clothing, blankets, kennels, horse boxes, habitats, aviaries and toys. It is an excellent spray for horses’ manes and tails against flying irritants. It is also an excellent minor wound care application. As well as for use on an immense range of dog breeds for pet and show applications, our spray and wound care products are particularly suitable for working dogs, i.e. security, police canines, emergency rescue applications and hunting dogs. Any canine that has a hard working day over sometimes rough country is our customer.